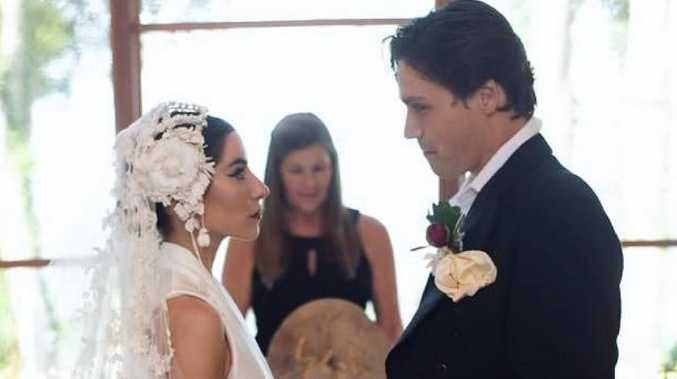 Lisa Origliasso and Logan Huffman wed.
VERONICAS singer Lisa Origliasso's new husband, actor Logan Huffman, has offered up details of the couple's wedding ceremony earlier this month. Officiated by a "high priestess", with readings of Hindi prayers and a marriage contract carved into oak by the groom himself, it was quite an unconventional affair. 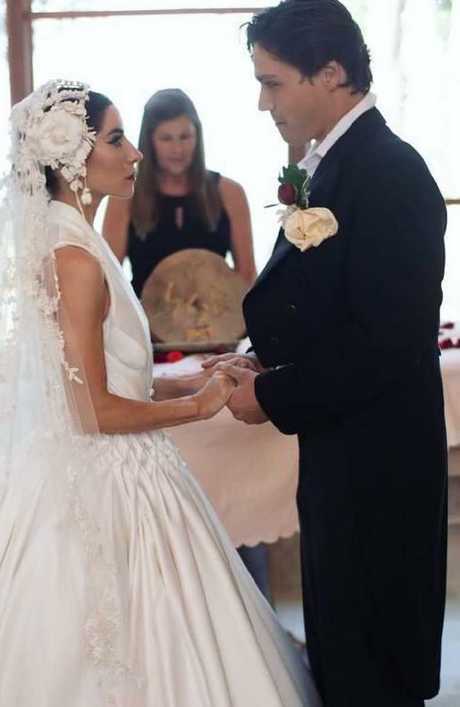 The pair got married over the first weekend of November at a Sunshine Coast property, Origliasso wearing a wedding dress created by Australian designer J'Aton Couture, which she told Vogue was inspired by both her "French and Italian ancestries" and the dress worn in 1937 by American actor Wallis Simpson at her wedding to the former King Edward VIII. A few weeks on, Huffman has given fans a lot more detail about the ceremony, which he said in a lengthy Instagram post "embodied several spiritual practices we hold dear to our hearts." "An integral part of our pre-ceremony above all else, was to show respect to the rightful owners of the land on which we wed. Wiruungga Dunggiirr from the Numba Gumbaynggiirr nation bestowed us with blessings and protection. It was truly the highest honour. "The ceremony was lead by our high priestess, Sonnie McAuley, who spoke of the similarities between Christ and Buddha. And the providence of their love. "Lisa's brother Julian Origliasso lit a white candle for those who could not be with us. And in honour of their family tradition, read a Roman Catholic prayer. It was a beautiful start to our ceremony. "Then my triplet mate, Noelle Huffman read one of Lisa and I's favourite Shinto love tales- The Wind in the Pine Tree. "Next my best man and triplet brother, Lucas Huffman read an Apache marriage blessing. In honour of the people of The Americas. "Lisa's twin sister Jessica Origliasso recited a beautiful Hindi prayer to Ganesh - the remover of all obstacles, to bless our marriage. "Next our high priestess spoke of the importance of mothers exemplified in the miracle at Canna. "Lisa and I recited our hand written vows to each other. Followed by the Ancient Germanic signing of the contact - in Runic writing of the Elder Futhark - which I had carved out of a stump of California coastal oak. "My advice to any lovers is to make your wedding day your own. There is no wrong way to love or worship. As long as it comes from the heart." Wow. After all that, you wonder if they had any energy for the reception. Origliasso has been dating Huffman, 28 - who is a triplet - since 2014. The American actor proposed to his girlfriend in late 2016. Her twin sister and Veronicas bandmate, Jessica, was a bridesmaid at the wedding.